So for those of you who cannot patch immediately for what ever reason, but happen to have F5 LTM infrastructure, good news – you could potentially use the following to mitigate the onslaught of bots already scanning for this vulnerability / script kiddies attempting to break websites for the lulz. I wanted to see how hard it was to execute this vulnerability. I installed a fresh version of Windows Server 2012 Standard in a VM and proceed to add the IIS role. 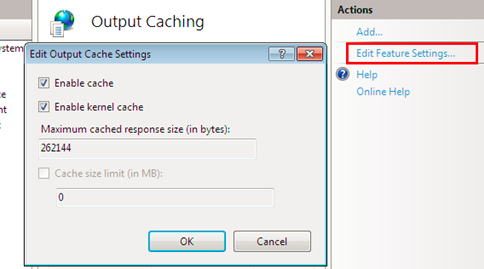 The bug is exploitable if Output Caching (Kernel Cache) is enabled on IIS (Which is by default). Output caching makes web pages tremendously responsive during the round-trip to the server. When a user requests a particular page, the web server returns it to the client browser and stores a copy of that processed web page in the memory on the web server and returns it to the client in subsequent requests for that same content, which eliminates the need to reprocess that page in the future. curl -v 192.168.1.129/iis-85.png -H "Range: bytes=18-18446744073709551615"
# If the range Matches REGEX log the result, return a 400 (patched) and then drop the socket. log local0. "Potential MS15-034 Exploitation Attempt to [HTTP::host] in uri [HTTP::uri] from [IP::client_addr] on VIP $vip"
The above should only be a stop-gap, patch this problem as soon as possible, or you’re gonna have a bad day! This entry was posted in Security, Windows Server. Bookmark the permalink.